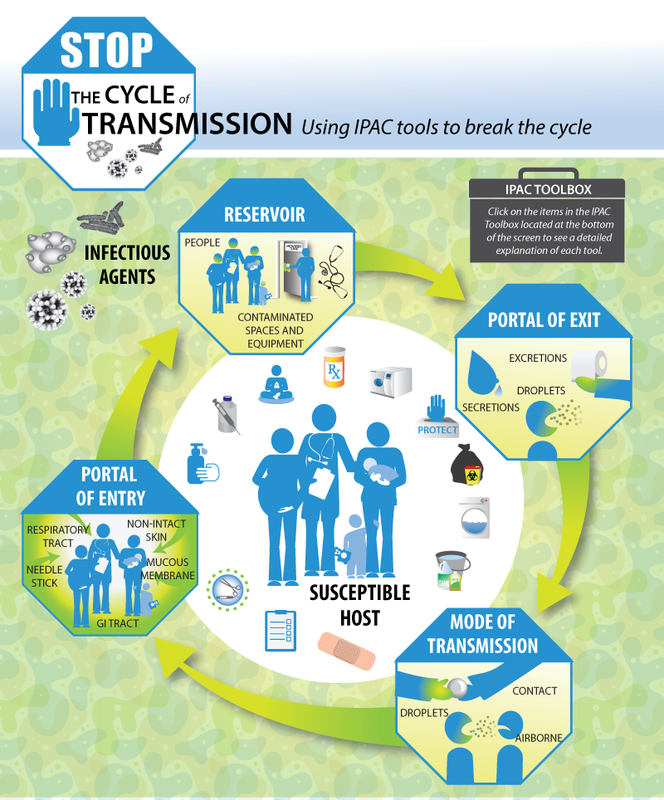 Appropriate infection prevention and control (IPAC) practices are a cornerstone to providing clients with high-quality care, safe care. The following tools and resources are aimed at empowering midwives and practice groups to reflect on their own practice and make adjustments in a way that takes into account the midwifery model of care. Suzanne Desaulniers, a midwife at the Midwifery Group of Ottawa, always knows when one of her colleagues has just finished an appointment with a client. She hears a familiar ‘swish, swish’, the sound of the midwife disinfecting the couch in the examining room. Replacing their fabric couches with vinyl ones is one of the numerous infection prevention and control (IPAC) improvements the midwives have implemented in the past 18 months. In addition to disinfecting the couches, the midwives also disinfect stethoscope faces, Dopplers and blood pressure cuffs between clients. When Desaulniers is examining a client and her mouth will be near the client’s mucous membrane, she wears a mask to decrease the risk of transferring any germs she may be carrying to her client. Before putting on personal protective equipment, like a mask, Desaulniers says it’s important to explain to clients why you need to wear it. She says not a single client has asked her not to wear a mask – in fact, they often thank her for taking their health so seriously. When she reflects on the practice’s IPAC journey, Desaulniers says she is “very proud of what the Midwifery Group of Ottawa has done. We’re questioning the things we believed about clients and infection and we’re looking at different ways of practicing. When midwife Isabelle Gelineau took over the clinic portfolio at Family Midwifery Care of Guelph, she began researching the most cost-effective way for the practice to reprocess its instruments while providing the safest possible product for clients. After looking at the time and costs involved in continuing to autoclave in the clinic, Gelineau met with the manager of the medical device reprocessing department at Guelph General Hospital to discuss the cost and logistics of having the reprocessing done at the hospital. She concluded that it made the most financial sense for the practice to outsource the work to the hospital. Gelineau says the manager of the hospital’s reprocessing department has been enthusiastic about partnering with the practice. The hospital does reprocessing for other local organizations, but the midwifery practice is the first small, community-based health centre to have its autoclaving done there. “The hospital is accredited, they follow all the guidelines from Health Canada and the Provincial Infectious Diseases Advisory Committee (PIDAC) and every five years every single staff member (in the reprocessing department) has to recertify through a reprocessing course. So they have a lot of rigid standards that we felt we could really get behind,” says Gelineau. Diana Doe at Born Midwives in Cambridge looked for outsourcing options when the practice decided that continuing to do their autoclaving in-was too much work. When the hospital where they have privileges declined the opportunity to do the practice’s autoclaving, the midwives decided to switch to disposable instruments. Doe says the disposable stainless steel instruments come in a birth kit that includes a pad to go under the client and a blanket and hat for the baby. Everything comes packed in a tightly-lidded plastic tub that can be used to catch and contain the placenta. The new disposable birth kits are bulkier than the ones the midwives used to carry, but after six weeks of using the instruments, Doe says the midwives haven’t noticed any differences between using the disposable instruments and the higher quality stainless steel ones they used to autoclave. For more information or questions, contact the AOM On Call team.